After peace was declared in 1945, the 36 year-old Busby was offered a job on the coaching staff at Anfield. However, Busby had requested that he be given more responsibilities over the playing side of the club, a job that was traditionally reserved for the club secretary. Liverpool’s directors refused to budge, and when Busby was offered the chance to manage the club with no interference from the board, Billy McConnell, the Liverpool chairman at the time, eventually persuaded Anfield directors to let Busby leave. Busby took over the reins at Manchester United at the beginning of October 1946. He immediately put his mark on the side leading them to the runners-up spot in the league, behind his former employers Liverpool, by the end of the 1946-47 season. Manchester United were runners-up in the league in 1947, 1948, 1949, and 1951 before winning the championship in 1952. By this stage, the side captained by Johnny Carey was beginning to show its age, and a new set of players had to be found. Busby, who had achieved a great deal of success in spite of his lack of previous managerial experience, was expected to spend large sums of money on high profile players. Instead, he gradually replaced the older players with players as young as 16 and 17. These included right-back Bill Foulkes, centre-halves Mark Jones and Jackie Blanchflower, wingers Albert Scanlon and David Pegg and forward Bill Whelan. Among them was Duncan Edwards, judged by many[attribution needed] to be England’s finest player of his era, and capped by England at 18 – setting a record for the youngest-ever full international that remained unbroken for more than 40 years. During this period, the team picked up the affectionate nickname the Busby Babes, due to the youthfulness of some of the players he fielded. They won the league in both 1956 and 1957, and were runners-up to Aston Villa in the 1957 FA Cup Final. The young side was so successful that centre-forward Tommy Taylor and goalkeeper Harry Gregg were United’s only major signings over a spell of four years. Busby and his team began the 1957-58 season full of ambition for an assault on the Football League title, FA Cup and European Cup. On the way home from a European Cup tie against Red Star Belgrade on 6 February 1958, their plane crashed on the runway at Munich Airport. Seven players and three club officials were among the 23 people who were killed. Duncan Edwards later died from his injuries, while two other players were injured to such an extent that they never played again. Busby suffered multiple injuries and twice received the last rites, but he recovered from his injuries and left hospital after two months. He was present at a new-look United side’s FA Cup final defeat against Bolton Wanderers at Wembley three months later, and resumed full managerial duties from assistant Jimmy Murphy for the following season. Busby had been appointed as Scotland’s temporary manager and took charge of the team for two games later that year against Wales and Northern Ireland, giving Denis Law his first cap. After the crash, Busby built a new side around Munich survivors including Harry Gregg, Bobby Charlton and Bill Foulkes. He also brought in players from other clubs – these included David Herd, Albert Quixhall and Denis Law. By 1964, Busby had discovered an exciting young talent in the shape of Northern Irish forward George Best, rated by many[attribution needed] as the finest footballer of the decade. In 1963, Busby had successfully rebuilt United as he guided them to a 3-1 victory over Leicester City in the FA Cup final. They were league champions in 1965 and again in 1967, with only a defeat on the final day of the 1965-66 season stopping them from recording a rare championship hat-trick. The biggest success of his career came on 29 May 1968 when the team won the European Cup. He retired as manager a year later but remained at the club as a director, handing over managerial duties to trainer and former player Wilf McGuinness. When McGuinness was sacked in December 1970, Busby briefly returned to his managerial duties, although there was never any question of him returning as manager on a permanent basis. He then reverted to director for 11 years, being made president in 1982. 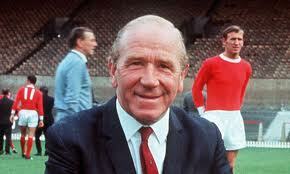 Busby was awarded the CBE in 1958 and was knighted following the European Cup victory in 1968. His testimonial was held at Old Trafford in August 1991, in which a Manchester United side featuring a new generation of star players including Mark Hughes and Steve Bruce took on a Republic of Ireland XI, the result was a 1-1 draw. He died of cancer, aged 84, in January 1994. He was buried in Southern Cemetery, Manchester. Busby was made an inaugural inductee of the English Football Hall of Fame in 2002 in recognition of his impact on the English game.